Photo right: Nearest to the camera is Mr. S. L. Tyler and on the right Mr. H. H. McIntosh (Sydney) then comes Mr. H. A. Raseley (Delco) (Dayton, 0., U.S.A.), Mr. C. E. McIntosh (Sydney), Mr. R. Graham Tucker (Melbourne), Mr. F. E. Wodell (Detroit, U.S,A. 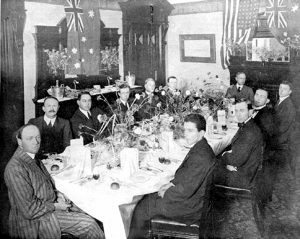 ), (G.M.E, Co.), Mr. P. A. Mclntosh (Sydney), Mr. H. C. Piper (Henry W. Peabody & Co., Sydney & New York), Mr. C. C. Rust (G.M.E.Co., Sydney), Mr. P. Marshall (Adelaide), Mr. W. J. Strachan (Brisbane). The first week in October has brought together the Interstate Buick agents. They met in Sydney, at.the headquarters of the branch of the Buick factory. Their object in coming together is to discuss the best ways and means of marketing the coming season’s production of the Buick factory. The greatest desire of the agents is to hit upon an economic basis so as to keep down the selling costs and the prevention of increasing price of the cars. Just what this has meant in the past -year has been that instead of increasing the price of Buick cars about $50 or more as most other houses have had to do, the Buick agents have only found it necessary to increase the price of their cars $30. When the price of the six-cylinder car was decided on last year the freight rates stood at 50/- per ton, since then they have risen as high as $10 per ton, showing an actual. difference in freight of about $7/10/- per ton on goods’ measuring about nine tons equalling about $66, yet through the medium of the Buick Conference these agents have come together and have found ways and means whereby they.have not found it necessary to increase the price of the car $66 for extra freight. This year the new model four cylinder car was inspected and tried most thoroughly by the agents and tests have proved very satisfactory, more especially in the hill climbing ability of the car. Hills in and around Sydney on which it was necessary to change gear in the previous four-cylinder models, were easily negotiated on top gear with six persons aboard, a maximum speed of fifty-two miles was obtained. The petrol consumption works out about the same as that of the previous four- cylinder models. Next September or October whether there will be a new model Buick or not the agents of the various States will again assemble and discuss further business experiences with a view to further economy to be exercised for the benefit of our patrons.